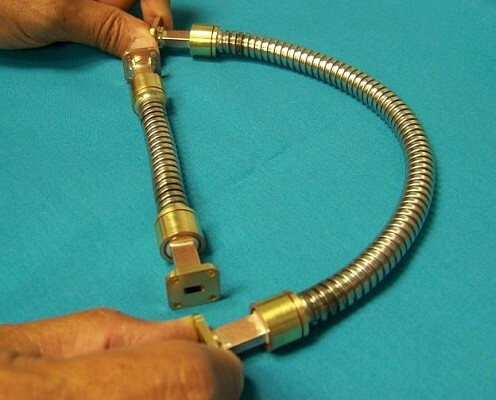 ATM manufactures a high quality line of flexible waveguides, waveguide assemblies, subassemblies of components, and assemblies in packages specially designed to meet all of your requirements. We offer flexible waveguides that flex only, and also models that flex and twist. Consult the tables below for specifications. 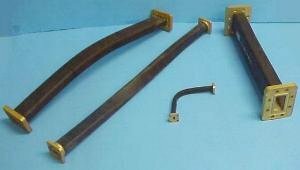 Please note: All of our flexible waveguide is made from brass material. For more information please call us and discuss your needs with our design engineers. For use in Hi Power Applications. Finished with high temperature paint. For brushed on neoprene jacket change model to "123"
WG Size Freq. GHz I.L. * When creating a model number to place for order, please substitute the letter (L) in the model number examples with the number of inches your assembly will be. Change Model No 124 to 123 for Neoprene Jacket Coating. 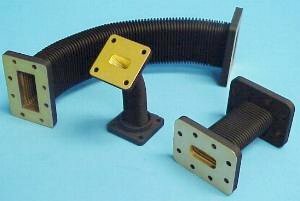 Used in requirements where both bending and twisting of the Waveguide is needed. Supplied with Neoprene® jacket in order to hold pressure, as a standard model. Silicone jacket available upon request. WG Size Freq GHz Max I.L. * Important note: When creating a model number to place for order, please substitute the letter (L) as shown above, with the number of inches your assembly will be. * Note: Bending Radius is limited by the minimum bending radius of the armor. ** Note: Bending rating radius for Repeated H Plane is larger than the minimum bending radius of the armor. Please note: Standard material for Armored flex assemblies is brass.